Analyzing different plasma conditions is important to understanding space plasmas; different instruments are used to study plasmas, depending on condition and location. For example, the plasma between the Earth and sun is tenuous—so tenuous that we cannot see it—therefore we send space probes to measure it directly. 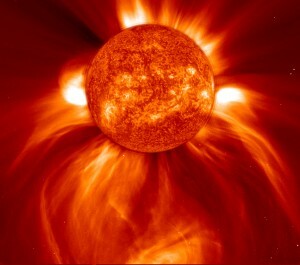 In contrast, temperatures of plasmas nearer the sun are too high for instruments to survive; however since the plasma is dense at the sun the plasma can be remotely imaged by cameras. We can now actually see much of solar wind with coronagraphs and heliospheric imagers, but imaging cannot provide the detailed physical information provided by in-situ sampling of the solar wind and other space plasmas. The upcoming Magnetospheric MultiScale (MMS) mission, scheduled to launch in 2014, will study how magnetic energy can be converted to kinetic particle energy. The Solar Probe Plus mission, set for launch in 2018, will investigate how solar wind particles get accelerated.